Now that I have children of my own, I realize that someone had to make all that magic! The holiday memories are still amazing, but they’re quite a bit more stressful. There’s so much pressure to make everything perfect, and most of it comes from me. I feel like I need to give the perfect gifts, bake the perfect treats, and plan all the fun. Last year I even volunteered to chair the kids’ kindergarten holiday party (even though I had an infant)! It’s so easy to get caught up in the Instagram and Pinterest worthy holiday quest. 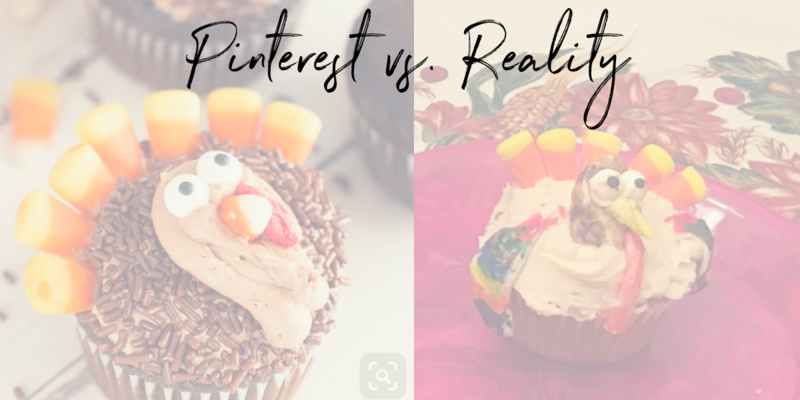 Friends, I spent $30 on candy corn and cookie supplies so that my kids could decorate Pinterest inspired turkey cupcakes, plus all the time for set up and clean up (hot tip: do NOT let your six year old peek over your shoulder while you’re scrolling Pinterest). Did my kids have fun? Yes. Would they have had just as much fun with some sprinkles and grocery store gel icing? Probably, and I could have spent the extra on a bottle of wine to share with my husband while we scraped frosting off the kitchen. This year, I’m trying to take a step back and slow down. My best holiday memories were not Pinterest worthy. There are pictures of my gingerbread people and they were not works of art! Our family Christmas cards were not pristine portraits. One year, my mom used the picture taken less than 24 hours after my sister was born. She looked (and was) completely exhausted, we were wearing clothes we picked out ourselves, and my dad had disposable scrubs. It went out 5 days after Christmas and guess what… Everyone loved it!!! The best gift I can give my family is a healthy, happy, and calm mama. So I’m staying off Pinterest and taking Instagram posts with a grain of salt. I’m setting out the craft projects and stepping away. I’m letting each child pick one holiday treat to bake and I’m buying the gingerbread house kit (another hot tip: melted marshmallows make excellent construction frosting). I’m keeping meals simple and healthy and sticking with my workouts. Most of all, I’m reminding myself that each year only happens once, but the holidays will come again. If we don’t do all the things and have all the magic this year, that’s okay. It’s just something new to experience next time. In the end, the joy and magic is the time we spend together. P.S. Anyone want some candy corn?